The 2016 Winter League will be upon us before we know it. The first match will be in October so look out for a list in Lionels Tackle on which to register your interest. Best 6 results from 8 count towards the series. Pools are £8 all in, of which £5 will be paid on on the day (1st, 2nd and 3rd) The remaining £3 will be held until the end of the 8wks and again paid out 1st, 2nd and 3rd overall. However feel free to come along and fish the odd match for £5 with your result not affecting the points on the day. So with this the final round, and best 6 results from 8 counting towards the outcome, we had a tie. Pete Evans and Mal Griffiths both recorded 3 wins, 2 seconds and 1 third each for 64 points out of a possible 72 points. In third place was Mike Delve with 45 points. This was fished in attrocious conditions, gale force winds and driving rain. Round 4 was fished in extreme conditions with winds gusting to 45mph. 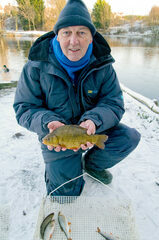 Mal made the most of a good peg in atrocious conditions, by fishing the feeder. Mark actually caught just under 20lb, however the rules of this comp say that all large carp are to be returned to the water immediately and count as 5lb. So congratulation to Malcolm for doing the double in winning both the Summer League and the Winter League. However worst 2 results can be dropped. The top 3 will definitely come from the above 7 anglers. The 2012 Winter League is upon us and the first match is on Sunday 7th October. The draw for all matches will be at 9am with fishing between 10 and 2-30. 1st match 12 pounds with 6 going into a kitty for the final payout to top 3 in the series. Subsequent matches will be 8 pound with 2 pounds going into the kitty and the rest paid out. There is no peg fee taken and best 6 results from the 8 match series to count towards the final placings. It is still up for grabs after 7 rounds with any of the top still 4 able to win the series. nb lowest 2 scores to be deducted from each overall total. This was a strange one. Possibly the best set of weights recorded in a winter league match at this time of the year. The winner was Mal with 15.05.00 from peg 34. Mal fished a straight lead into 17 foot of water for a succession of quality Ide. In second was young Mike Rough with 10.07 .00 from peg 16 and alternating between straight lead and pole at 13m. Unluckiest of all was 3rd place Joe Bird. Joe caught a total of 25lb, but this included an 18lb Ghosty, which under winter league rules counted as 3lb, a travesty as he landed this on a 22 hook and .01 hooklength whilst fishing a feeder from peg 15. His final weight was recorded as 10.04.00. Other notable weights were 12 year old Kristan Jones with 7.10.00 from peg 31, Pete Evans with 7.04.00 from peg 19 and Luke Baker with 5.15.00 from peg 12. 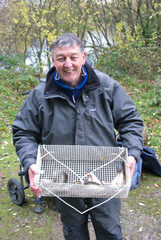 The final round was fished today on the Trap Pool and what a close thing it was. In the week leading up to the match, good catches were being had by all, so expectations were high. Joe Bird, the series leader, drew peg 33 and made the decision to stick with the tip. Joe alternated between feeder and straight bomb to catch a fine net of Ide and Skimmers for a weight of 9-12-08. Most of his catch were taken on maggot, with pinkie responsible for a bonus skimmer. Steve Dorring drew the next peg to Joe, peg 32 and opted to fish pole tactics with caster on the hook. Steve landed more than 60 fish for a weight of 9-07-08. And in third was Mike Griffiths on peg 27. Mike opted for yet a different method, he chose to fish the slider and with maggot as hook bait had a good catch of quality Ide for 9-01-00. 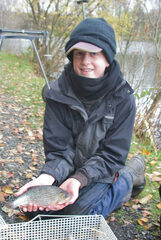 Mike Rough was top junior on the day with 7-05-08 of Ide, Roach and Perch taken on long pole from peg 25, the Jetty. The series was won by Joe Bird with a toatal of 68 points after dropping his worst 2 results. In second spot was Pete Evans with 60 points. Ist on the day was Tony Belcher. Tony drew peg 8 and fished a feeder quite close in to take a mixture of Roach, Ide and Perch and Skimmers for a weight of 4.08.00. 2nd was Joe Bird with 3.06.00. 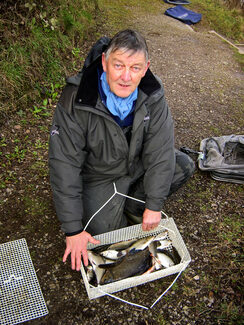 Joe fished feeder from peg 33 and was rewarded with a similar mixed bag. 3rd was Mike Griffiths with 2.12.00. Mal drew peg 15 and fished a straight lead into 15 foot with maggot on the hook and loose fed maggot over. Todays match was won by Joe Bird (pictured right) Joe drew peg 13 on The Rubble and set up to fish a groundbait feeder to the island. After a slow start, he began to pick up Roach, Ide and Perch to red maggot and before long Skimmers and a good Crucian arrived to boost his total weight to an impressive 9-08-00. Second spot went to John Porter with 5-10-00. 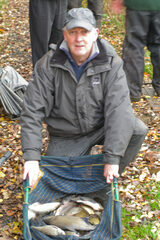 John drew the Willow and fished worm over caster on a long pole for a catch of mainly Roach and Ide. Some way behind was Mike Griffiths with just under three pounds. Mal drew peg 25 The Jetty and quiver tipped maggot for a catch of mainly Ide. Today saw the start of a new Winter League series on the Trap pool. The series consists of 9 matches (as listed in Club Card) of which, the best 7 results count towards the overall positions of which the top 3 will be paid out. So if you missed this match all is not lost. In the event of the pool freezing over the number of matches will be reduced. Todays winner was John Porter (pictured right) John drew inform peg 33 and made no mistake with a fine performance to record a weight of 16-04-00 of Bream, Skimmers and Ide. John opted for feeder tactics and caught both up to and short of the island. Some way behind was Pete Evans on the Jetty, with a bag of bits taken on squatt and pinkie for a weight of 5-02-00. Third spot went to Craig Stubbins with a level 5lbs. Craig caught Roach and Perch well off bottom on peg 34. For the fifth match in a row, the Trap pool was as flat as a mill pond,no breeze or ripple whatsoever, and coupled with bright sunshine and an overnight frost, a struggle was expected. Pete Evans (pictured left) won with a modest weight of 4-0-0.This consisted of a dozen small Roach, a few Ide and 3 Skimmers the best of which was about 1lb 8oz. Peter drew peg 21 and fished a long pole at 14 metres in 3.8m of water. Most fish came to red maggot fished over loose fed casters. Bites were plentyful but hard to hit, a change to caster hook bait late on produced the bonus skimmer. In second spot was Mike Griffiths with a weight of 3lb 9 oz. Malcolm drew peg 31 (the jetty) and fished into the deep water with slider tactics. He caught a few Roach before the bites became so difficult to hit that he gave up on the method and fished a straight bomb on the same line. This greatly improved his catch rate and he caught small fish steadily for the last hour and a half. In third spot, making a guest appearance was Mike Ellis. Mike drew peg 45 (the Rock) and caught small fish on small pieces of worm for a weight of 3lbs. Steve Doring and Joe Bird tied for fourth spot, and Steve caught this big Perch on pole fished maggot. Once again, an overnight frost and still bright conditions suggested a further struggle was on the cards, and it was for most. However Steve Dorring drew the fancied peg 45 (the rock) and was quickly off the mark with a small Barbel taken on pole fished maggot in about 12 foot of water. 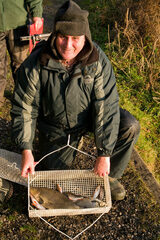 A further half dozen Barbel followed and a few Ide for a winning weight of 3lb 13oz. 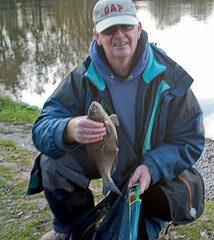 Pete Evans fished long pole from peg 43 and used caster to tempt 3lb 7oz of Roach and Ide for second spot. Pete fished a 3.5 grm float in 15 foot of water. 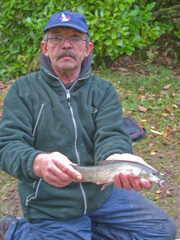 The flat conditions made for a slow start with just one small Roach to maggot in the first hour. Sport picked up once a breeze put a ripple on the water, and a steady succession of small Roach and Ide followed to caster fished hard on the bottom. Third spot was taken by Joe Bird from peg 38 on the Sandbank. Joe fished a small open ended feeder into 20 foot of water, and caught a few small skimmers and Roach for a weight of 3lbs. Conditions today, appeared slightly better than of late . Slightly overcast and with a light breeze, expectations were a little higher. How wrong can you be, the wind was very cold and with temperatures around 4 deg it was bitter, and for the first time in the series, the skimmers were conspicuous by their absence. The resultant weights were low but very close with just 12oz separating the top four.Joe Bird (pictured left) came out tops with 2lb 12oz. Joe drew the fancied Rock (peg 45) and pole fished maggot in twelve foot of water for a catch of Roach ,Ide and just one small barbel. 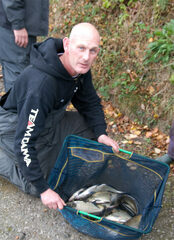 In second spot was Pete Evans with a weight of 2lb 6oz. Pete drew the jetty (peg 31). Recent results have shown the top weights to come from around twelve feet of water and to achieve this from this peg, Peter had to fish a very long pole (14.5m) angled towards peg 12. Small Roach and Ide came to red maggot and caster hook baits , fished hard on the bottom beneath loose fed caster. Third place went to Michael Rough with a weight of 2lb 4oz 8drm. Michael drew the rubble (peg 14) and persevered with fishing the pole in very cold conditions, eventually to be rewarded with a cracking Roach of 1lb 2oz. The remainder of his catch consisted of Roach, Perch and Ide. The league is now led by Peter Evans with 70pts, but bearing in mind the requirement for each angler to drop their worst three results, things become very close with 2 rounds to go. 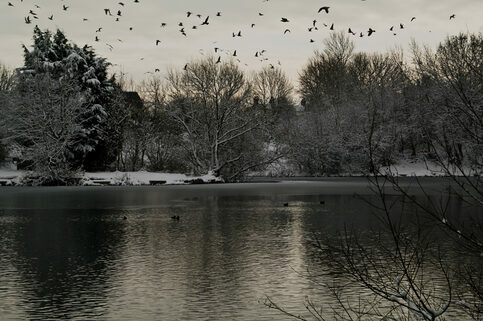 Winters definitely arrived, at 9am this morning the temperature on the Trap pool car park was minus 6 deg c. The pool was 40% ice and with snow underfoot, it was going to be torture. We stuck with the same peg selection and although largely clear of ice, half the pegs saw little if any sunshine. Winner on the day was Joe Bird with a disappointing weight of 1lb 13oz 8drm. Joe drew one of the colder pegs (peg 31, the Jetty). Joe fished a small feeder into the deeper water and after a slow start was rewarded with a very unseasonal Crucian Carp that fell to a double pinkie hookbait. The remainder of his catch was made up with Roach and Ide to single red maggot. 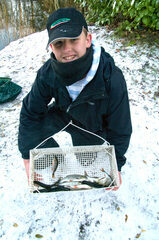 In second spot was junior angler, Ryan Willcock. Ryan drew peg 45, probably the coldest on the pool and did really well to push Joe all the way with a weight of 1lb 12 oz 4 drm. This consisted of small Roach, Ide and Perch all to pole fished white maggot in 12 foot of water. Ryan was actually unable to fish for half an hour when an ice flow drifted across his peg. Third spot went to Mike Griffiths with 13oz from peg 37. Mike persevered with a straight lead and caught quite late on just pipping Pete Evans on 12oz 4drm and Phil Catherall on 12oz. Well finaly, the Trap Pool is free of ice and the last match in the series went ahead this morning. The strong winds of yesterday had subsided, and although mild it rained for the full four hours. The match was narrowly won by on form Joe Bird. Joe drew peg 41 and set up with the usual feeder tactics. After a slow start, he caught a few skimmers and Ide for a rather poor weight of 2- 12 - 4. This was Joe`s 3rd win in a row, and 4th in the series. In second spot , just 4 drams behind was Mike Griffiths. 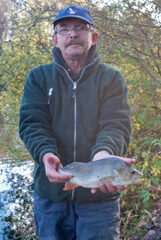 Mike drew the Jetty peg 31, and fishing the tip, with maggot on the hook he caught Roach and Ide for a weight of 2-12-0. Third went to Pete Evans with a weight of 1-13-0. Pete drew the fancied Rock peg 45, and made a right hash of it missing about a hundred bites on caster. This was after droping their worst three results. The summer series will not now start until the new card is issued in April, however, we will be running a few sweepstakes before then. The dates will be posted on the Latest News Page of this site so keep looking.